The Cool House: Good news, bad news, and a mystery. Good news, bad news, and a mystery. The good news is that it rained really badly this morning so the handyman couldn't work on his other, outside, job. Actually, that's probably not such good news for his other client but great news for me because last night he phoned to say I would have to wait for another 10 days to get the hardware installed and this morning he decided he's rather be dry working on my baths. 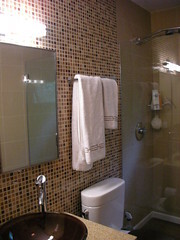 He installed the Motiv towel bar, robe hook and toilet roll holder in the boys' bath. That means we can officially call that bathroom the winner in the first to be finished stakes as the girls' bath still needs a piece of trim and he didn't have the correct saw to do that today. Then he filled a hole in the back door lintel that had rotted away and patched the ceiling in the downstairs bath. It was when he moved on to patch the wall in the laundry room that we realised we had a problem. The wall was more than stained, it was damp if not actually wet. After staring at it for a while and running upstairs to see if we could see a cause we decided the best option was to cut a hole and try and discover the source. I was imagining water pouring through the walls when he opened it but behind was bone dry. Huh. There is a wastepipe there but it doesn't appear to be damaged: it's not green or damp, there are no beads of humidity anywhere but the sheetrock had just about dissolved and was definitely goopy to the touch. So we are leaving the nice hole in the wall until he can get back to us again (the week before Memorial Day, he promises) and I'll run the toilets, showers, baths and sinks upstairs to see if anything causes a leak. Otherwise when he shows up next time, he'll put in a piece of sheetrock and we'll pretend the whole thing never happened.